Earlier this week it was revealed that Google was planning to "pause" development on its Allo messaging service, reassigning those resources to Android Messages and RCS—which is apparently also being called "Chat" by Google. The company remains ostensibly committed to the Allo platform as a whole, but Google's graveyard is littered with dead messaging services. Some of them are even still being used in the absence of further improvements, like Hangouts. That got us to thinking, which of Google's messaging apps might you be using? Shortly after Allo was announced back in 2016, we actually did a related poll, asking our readers if they thought Allo should replace Hangouts. At the time, no one had actually used the new messaging app, but people were moderately enthusiastic about it, voting with a nearly even split. Combined with the results of our Hangouts/SMS poll in 2015, most of our readers seem to be well invested in Google's various messaging platforms. 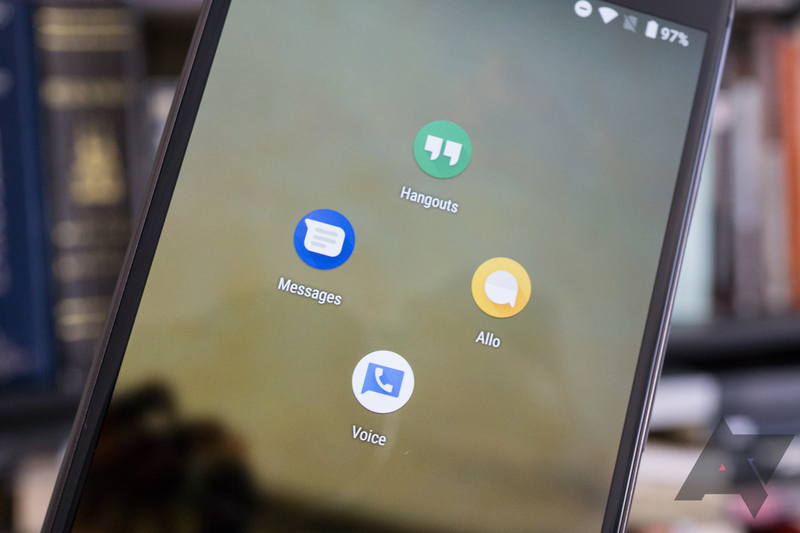 We live in an Android and Google-centric bubble here at Android Police, so that is likely to skew our own perspective and circumstances, but I still use Hangouts and Android Messages on a daily basis. (Curse the United States' dependence on SMS.) While I also technically have Allo installed on most of my phones, I can't remember the last time I used it or which device it's currently active on. What about you? Which of the still-living Google mobile messaging services do you use? For the purposes of this poll, we'll be sticking to apps designed specifically for messaging, even if you could technically communicate with people via posts on Google+ or YouTube comments, etc. And feel free to select all that apply if you use more than one. What Google messaging services do you use?